Demand for food safety products in the US is forecast to rise 6.7 percent per year to $2.9 billion in 2014. Recent high-profile foodborne illness outbreaks, in addition to large product recalls due to food safety concerns, will continue to fuel demand. Demand for food safety products will also be boosted by the adoption of more stringent food safety regulations. These and other trends are presented in Food Safety Products, a new study from The Freedonia Group, Inc., a Cleveland-based industry market research firm. 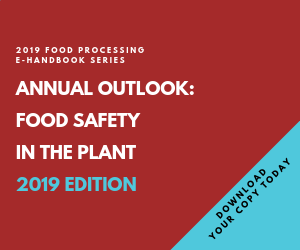 The food processing segment, which accounted for 70 percent of total demand for food safety products in 2009, will continue to dominate the overall market. Among the various food and beverage processing industries, the largest share of food safety product demand will stem from the meat industry. Advances in meat output will support demand for diagnostic testing products (such as those used to detect Salmonella and E. coli) and disinfectants and sanitizers, as well as disinfection equipment. Demand for food safety products in foodservice establishments will be supported by growth in the foodservice industry, as consumers seek convenient, ready-to-eat offerings that provide alternatives to what is typically made at home. Food safety product demand in the foodservice sector will also be boosted by efforts on the part of restaurant operators to avoid the devastating impacts of a foodborne illness outbreak on their image. In particular, such efforts will include the use of more effective disinfection products, which will fuel demand for disinfectants and sanitizers used in restaurants and other eating and drinking establishments. Disinfection and diagnostic products will remain the largest product segments by far. These products tend to go hand-in-hand, as diagnostic products are often used to verify that disinfection products are being utilized appropriately. Sales of smart labels and tags will experience the fastest gains among product types, driven by the rapid adoption of new smart label technology in food packaging and by their use in providing traceability throughout the food supply chain. Gains in RFID tags are expected to be strong, as their use for inventory tracking and management continues to grow. On the other hand, demand for bar code labels and tags will be restrained due to market maturity, as well as continued loss of market share to RFID tags. Food Safety Products (published 04/2010, 290 pages) is available for $4,800 from The Freedonia Group, Inc., 767 Beta Drive, Cleveland, OH 44143-2326. For further details, please contact Corinne Gangloff by phone 440.684.9600, fax 440.646.0484 or e-mail pr@freedoniagroup.com. Information may also be obtained through www.freedoniagroup.com.